-- Select a Size/Color -- 6-10" 10-16" - Out of Stock! 14-20" 18-26"
Dress your dog in a dog collar that's both rugged and fashionable! 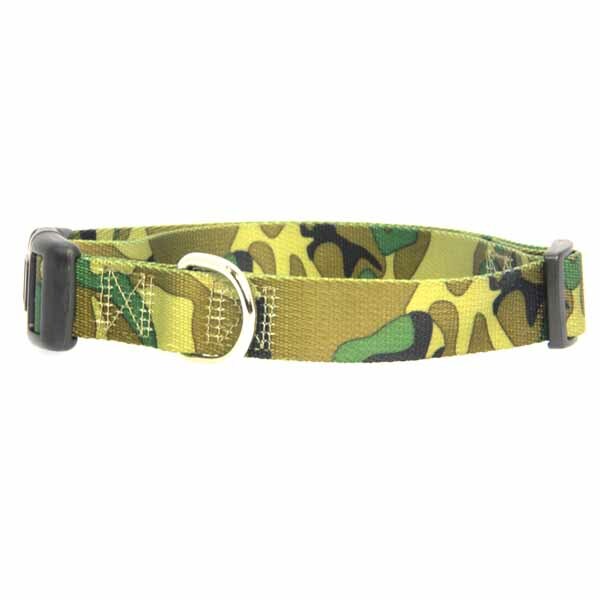 We love the camouflage design on this rugged camo collar! The Guardian Gear Camo Dog Collar in Green is made of durable, woven nylon and includes a quick-release plastic buckle. It's heavy-duty hardware and thick nylon make this collar dependable and fashionable. 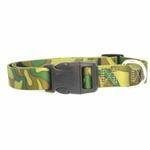 Guardian Gear Camo Dog Collar - Green Customer Photos - Send us your photo! Oreo is a very smart dog with a mind of his on. My baby doggie Kai in his collar. My sister took the photo. Posted On 04/14/19 by Kathy H from Janesville, WI Yes, Kathy H recommends this product! Liking this camoflauge collar, seems to be well made. Nice addition to my fur babies collar collection!! Fun to change out collars for different occasions. We'll use this one for this summer up north. Our Ben is quite the fashionista!!! Thanks Baxterboo!!! Posted On 03/23/17 by harold b from lufkin, TX Yes, harold b recommends this product! The old collar was still good just fading and show signs of wear. The new one is nice and bright . Posted On 09/28/15 by Lisa M from Macomb, MI Yes, Lisa M recommends this product! Bought this to replace my pups other collar he grew out of. Nice basic collar for the short term he'll need it until it too needs to be replaced. Shirts and hoodie for dogs did not fit even though I adhered to the measuring guidelines. Disappointed. Leash is high quality. Toys are adorable.